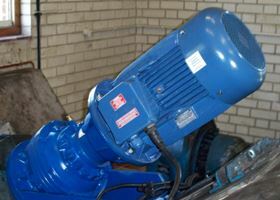 As part of a wide reaching raft of proactive measures aimed at minimising its energy usage, water and wastewater services provider Anglian Water has decided to replace old screw pump gearboxes with new innovative planetary gearboxes. Work has been carried out on a trial site at Maldon in Essex. Working closely with Brammer UK Ltd, the UK’s leading supplier of industrial maintenance, repair and overhaul (MRO) products and services, Brevini has identified a suitable gearbox and developed a mounting bracket which allows the new gearbox to be installed without the need to re-engineer the original pump. Anglian Water is tackling issues such as climate change, going to great lengths to ensure it runs with the highest possible levels of energy efficiency. In a bid to further its efficiency, Anglian Water has employed the help of gearbox manufacturers Brevini through MRO specialist Brammer. Working with Brevini and Brammer, Anglian Water identified sites where conventional screw pump gearboxes were running with poor efficiency. The benefits of replacing these older gearboxes with Brevini’s highly efficient planetary gearboxes were obvious as they are able to run from a smaller motor than conventional gearboxes and can be retrofitted to existing structures which in turn decreases the cost of installation. A trial site at Maldon in Essex was identified where a screw pump gearbox was due for replacement. Following an on-site consultation, Brevini was able to recommend a suitable gearbox and design a mounting bracket which would allow it to fit directly onto the existing structure. The output shaft was designed to be of the same diameter as that on the previous gearbox, while a backstop was fitted to prevent the screw running backwards when it stops. Planetary gearboxes are capable of producing very large reduction ratios (they can reach 15,000:1) meaning that they are ideal for driving heavy rotors at slow speeds. Producing up to 800 kNM of torque the gearboxes can produce the same power as large ‘worm and wheel’ gearboxes despite being far smaller – often 60% lighter than their equivalent. Brevini gearboxes have a lifetime of over 100,000 hours when they are in constant use, keeping maintenance down to a minimum; one oil change per year is all that is needed. Since the installation of the new gearbox, the Maldon site has reported that the pump is running with 16% more efficiency than previously, the gearbox running to an efficiency of 96%. Running costs have been greatly reduced as the new gearbox only requires 13.4 amps compared to the previous 16.6. This equates to a 2.1 kW reduction in running power and a saving of £1,400 per year, a potentially significant saving if all the company’s gearboxes were to be replaced. Following the success of the trial installation, Anglian Water is currently identifying similar installations throughout its sites where other replacements can be made.